Lovely transparent overdrive that's like adding an extra channel to your amp. Easy battery access. Valve-like overdrive. Capable of subtlety. Compact chassis design. 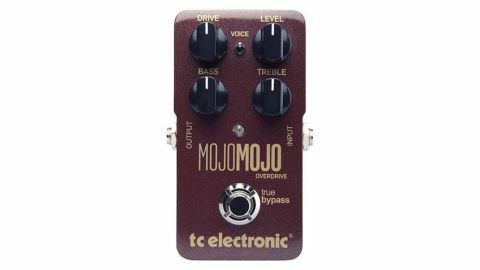 The function of the MojoMojo is to provide the sound of overdriven valves in a hard-working amp, and not just any amp - TC's desired flavour here is vintage tweed. Not a bad place to start. "The MojoMojo responds sympathetically to playing dynamics and has clarity"
Delivering valve-like overdrive or a clean(ish) boost to push your amp further, the pedal responds sympathetically to playing dynamics and has a certain clarity that lets chords ring through with individual notes intact. The toggle switch either keeps your bottom end girth intact or offers a slightly leaner sound while the tone controls operate over a sensible range if it's a tonal shift rather than a dirtier amp sound that's required.